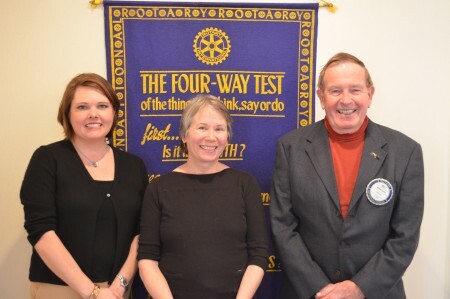 The Auburn Rotary Club recently hosted Bobbi Yeo (center), who recently joined the staff of the Lee County Human Society as its executive director. Yeo shared statistics regarding shelter operations, as well as updates on initiatives to increase adoptions. Once such program involves the humane society tapping into a network that relocates shelter animals from the overpopulated South to northern areas where there is a high demand but low availability of adoptable animals. Pictured with Yeo is Club President Martee Moseley (left) and program host Bill Luther (right).